Interests:Hunting, fishing, camping/hiking/backpacking, rugby, surfing this forum. Made a couple hour drive West from Billings to look at some gear at a price I couldn't pass up, which put me in a town I've passed through, but never explored- or even stopped in, for that matter- Livingston. The river and town are fairly well known, and I had done a quick bit of reading before I hopped in the car. Some reports claimed the river was murky and high, but with the main goal of the trip complete, I couldn't resist heading to an access point to check for myself. The air was cold, the sun was sinking, but the river here was braided through a gravel bar- calm enough to wade, and clear enough to tempt me into postponing (and eventually skipping) dinner. The first hole was running faster than I had initially thought, with the current barreling down the center. But the edges were calm enough where it dumped in to drift a heavy stonefly, and get it deep. After about half a dozen drifts and going deeper to tick rocks, the yarn indicator shot under! It's been a long winter, and the fish felt good- holding strong in the current, hard runs, and not showing itself. 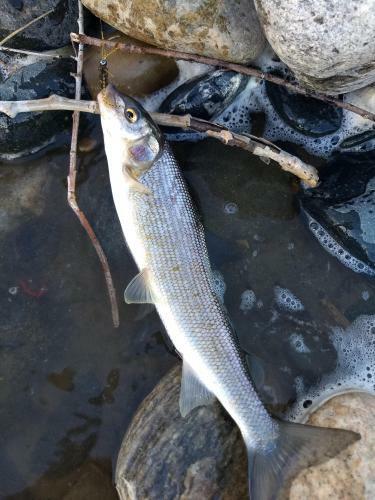 After a fight that I wish could've lasted a while longer, I landed a nice, fat ... whitefish. And I couldn't be happier. A quick picture, and back he goes. Several more casts and misses didn't produce a hookup (probably small whitefish), but the other side of the hole looked too good to not fish. I moved upstream and crossed. The second cast into the seam produced another take, but it wasn't the rocket into the current like a whitey, and it was right at my feet. The hookset was awkward, with the rod too high and far too much line out. 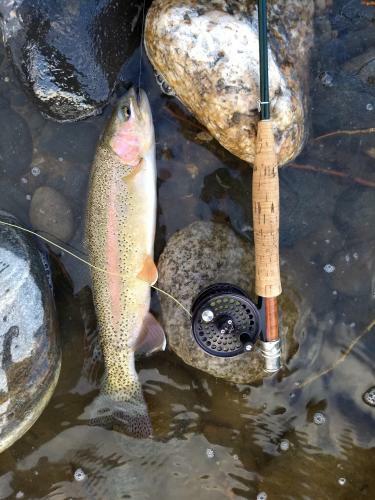 But the hook stayed, and after some flailing an backpedaling across the shifting river rocks, a decent rainbow came to hand. Another picture, and off it swam. After a couple more whitefish and a rainbow, I moved downstream to another hole, seeing if I could pick up one more- a small rainbow took the stonefly, and that was it. Around that time, the gentleman I had bought the gear from appeared in the bank above me, out for an evening walk. We chatted for a bit, and he headed home for dinner. The fish were all near the head of the holes, with the whitefish in the main current, and the trout in the calmer water on the side. Brought 3 spunky whitefish to hand, and 3 somewhat lazy rainbows, while the mountains passed in and out of the clouds. Not bad for an hour before dark. Whitefish have saved more than a few days for me out west. Nice!! They do everything you could want, except eat big streamers and jump. Next up- taste test. I really miss having crappie and sunfish around to get a fish fry together. They'll readily take drys at times. Evidently, they smoke very well. I think rps is right. From what I can tell, the bones in the fillets are single pin bones, like a larger trout/salmon/bass/white bass, instead of the "y-bones" like a pike, or the forked kind in a carp/grasscarp/Asian carp, or the star-shaped y-bones in any sucker/buffalo. Smoked fish is fine, but I still want my fried fish. And if I'm as good with a knife as I pretend to be, this could be the hot ticket. I'll probably try to keep 5 decent ones or so the next time I go out, to see if I'm just blowing smoke. Probably no pictures, though- don't want to slime up the camera. You're in my stomping grounds; too bad I'm not there now. Looks like you were fishing at the city park. The near channel used to carry most of the water in the river, but this past year it all but dried up. We'll see what happens when this spring's flood comes. Whitefish are pretty bad fried. You can make them palatable by carefully cutting out the dark red meat along the sides of the fillet. But that's the reason most people smoke them...you can make a boot taste good smoking it. I also found that if you soak the fillets in milk for a couple hours it improves the taste considerably. My wife still can't stand them, but I thought they were okay like that. The big ones WILL hit a streamer. Several good accesses for wading at the level the river is now. There is a walk-in access south on Highway 89, a couple miles north of the Emigrant intersection. I think the highway department is doing some work stabilizing the bank just north of that access, and it isn't obvious when you're buzzing up the highway at 70 mph, just a tiny pull-off and a small sign. But it gets you into some nice braids. You can also work your way up the bank a bit and get into some braids and reachable water from the Carter's Bridge access, or cross the bridge from the access and work your way downstream. There's also some opportunity from the Free River walk in access just south of town. And some good braids at the Sheep Mountain access downstream from town on Convict Grade Road...but I don't know if they've replaced the bridge on Convict Grade just east of Highway 89. You can even wade and fish around the island where the river is next to the Highway just south of town, where DePuys Spring Creek enters the river, though that spot gets pounded. It's still a great whitefish spot if nothing else. Al, I was really hoping you'd drop in since that is your stomping grounds. And you got it- the City Park. I imagine the river will come back to the near channel soon enough, given how the river swings, plus the amount of snowpack this year. It is too bad you aren't here. But if you were in Montana, we wouldn't have your posts from the Ozarks to enjoy. I'm out here full-time (minus next week in the Ozarks), so I plan to make the most of the time I have. Having said that, I guess I need to start tying more streamers to throw- I can't even imagine how a big whitefish pulls.